Seasonal The pyramid teabags are both eco-friendly and biodegradable. Sold in 100 count stand up pouches. The unique shape of our teabags, combined with long tea leaves allows for a truly exceptional tea experience. Little Green World, we believe that everyone should enjoy the everyday custom of having a good cuppa. The time and ritual of “taking tea” is as good for us as the health benefits of drinking the tea. However, we too are often unable to brew our tea and take the time for tea. 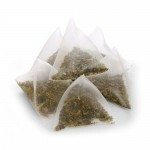 For convenience, our pyramid tea bags contains the same high quality leaves that go into any loose tea blends. The leaves are cut, roasted and blended specifically for our tea bags. All of little green world’s teabags are made from a modern mesh. Teas are refreshing to soothing and are all natural pick-me-ups. Our herbal teas are naturally caffeine free and may be used any time of the day. For a delicious cup of hot tea…pour boiling water over a tea bag and brew to desired strength. For refreshing iced tea…brew as directed and chill or add ice. Keep refrigerated. Tea Bags can be used a second time; although brew/infusion will be weaker in taste.